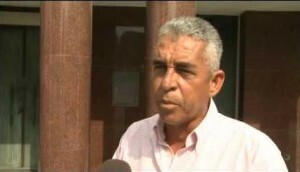 WILLEMSTAD - The planning of a sports lotto will never fall under the Ministry of Economic Development. "Over my dead body," independent MP, Glenn Sulvaran said. Sulvaran is also a coalition member and the one who initiated the discussions on a lottery during the coalition negotiations. Political party PAIS indicates in a press release that they support the initiative of their Minister, Stanley Palm (Economic Development). Palm wants through Fundashon Wega di Number Kòrsou (FWNK), the organization that organizes the daily number drawing, to organize the lotto and to act as a regulator for the entire sector. According to PAIS, the proceeds from the lotto will go towards projects for the sport, arts, culture and general education. Sulvaran wonders why Palm is taking so much time and energy in trying to organize a lotto. According to Sulvaran it is the Minister’s own concoction that the lotto will fall under his portfolio. “This is a typical case of target shift. The only way Palm could organize the lotto is if he gets and other ministerial post,” Sulvaran said. “The organization of the lotto falls under the lottery regulation, it is the responsibility of the Minister of Finance,” Sulvaran said. “Minister Jose Jardim will present a lottery regulation to the parliament. This regulation is now in the making. The Regulation regulates all activities on the island that have to do with gambling. This includes the FWNK, but also the Gaming Control Board (GCB) and the lotto.